The very first Bisto product, in 1908, was a meat-flavoured gravy powder, which rapidly became a bestseller in the UK. It was added to gravies to give a richer taste and aroma. 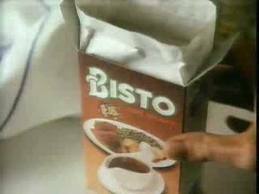 Invented by Messrs Roberts & Patterson, it was named “Bisto” because it “Browns, Seasons and Thickens in One”. Naming of the Bisto twins? In Birmingham in the 1930’s a competition was held to put a name to the two Bisto twin characters,a boy and a girl sniffing the beautiful aroma of Bisto’s gravy.The competition was won by Mr and Mrs Simmonds,who named the twins after themselves…they called them Bill and Maree.They were awarded a beautiful china doll. Bisto Granules were introduced in 1979. The granules dissolve in hot water to form a gravy substitute. This product capitalised on the growing preference among British consumers for foods (or food substitutes) that can be quickly and conveniently prepared. As of 2005, Bisto Gravy Granules dominate the British market, with a share in excess of 70%. Every UK grocery outlet is likely to have a Bisto product on its shelf. In 1919, the Bisto Kids (created by cartoonist Wilf Owen), appeared in newspapers and soon became popular. Bisto is notable both for the age of its brand and for the advertising campaigns it has used. Although the Bisto Kids have not been included in Bisto advertising for many years, many people still recognise them; the Bisto Kids, a boy and girl in ragged clothes, would catch the odour of Bisto on the breeze and exhale longingly, “Aah, Bisto!” This clever gambit was intended to capture the all-important “Oliver Twist” (or “urchin”) segment of the working-class market. The Bisto Kids were also part of more elaborate advertising campaigns in later years. 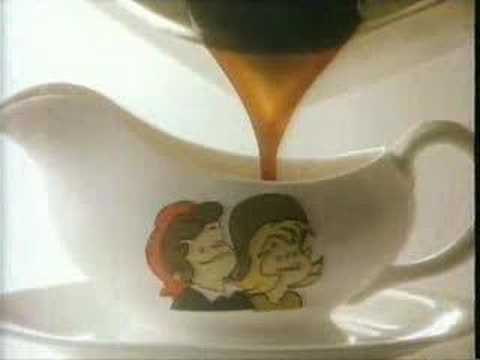 During the 1980s, the company released a series of commercials in the UK which featured a song that included the recurring phrase, “Never in a month of Sundays”. In fact in 1984 RHM Foods launched a nationwide competition to find the first live Bisto Kids. This was the beginning of “The Bisto Kids of the Year Awards” (which no longer runs in the UK). The first ever competition was won by Hayley Griffiths and Jimmy Endicott from Doncaster. They were six years old at the time, and became the faces of Bisto both for public relations and marketing events, and also appearing in an advert shown on prime time tv to find the next Bisto Kids. The advert showed Hayley and Jimmy fighting over a magnifying glass as they searched a giant globe, and finished with them in the gravy boat catching packets of Bisto, before disappearing in a puff of smoke. For 12 months the pair were the modern incarnation of the raggedy urchins mentioned above, until they handed over their crown in 1985. The company sponsors the Bisto Book of the Year Awards in the Republic of Ireland. The latest campaign for Bisto encourages families to sit up at the table for one night a week to eat ‘proper’ food. This advertising campaign has seen support from unlikely sources such as politicians and members of the clergy.